The Framed Lady: Twenty eight. The third trimester! Twenty eight. 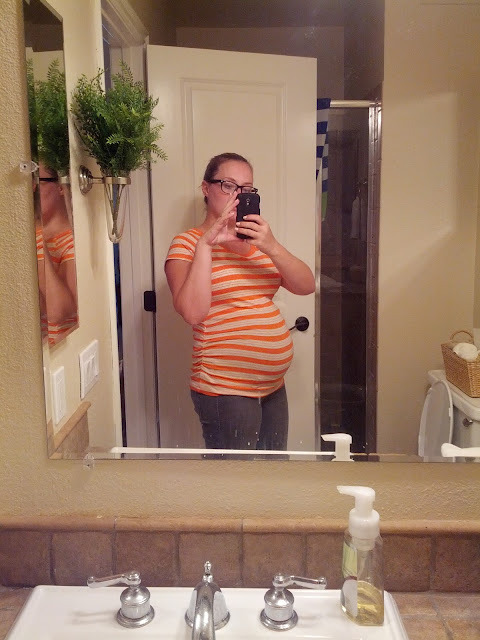 The third trimester! Sometimes, when Conrad's working on the computer for hours on end, we go visit him and this is the attention that is given. Alright. Here's the dealio. 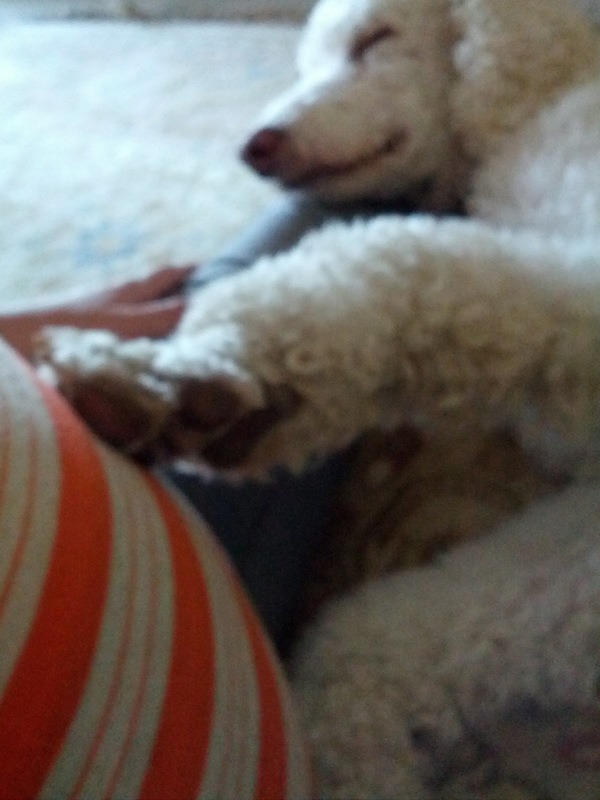 My parents' dog Jasper (a standard poodle, who was also my dog, but then I got married and moved out) is super mellow. He's a lounger. He needs a minimum of 18 hours of sleep in a 24 hour period, and his waking hours are spent laying on the floor tracking us with his eyes as we move about the room. He's also pretty intuitive. He's smart. Some dogs are stupid. Some dogs yap and lick and hump, and he does none of those things. He's obedient and contemplative and skeptical of people who are overly excited, and he is extremely sensitive. Conrad once saw his new poodle haircut and laughed at him. Jasper promptly became very embarrassed and wouldn't go near Conrad for the rest of the day. You have to make him feel good, or he gets really sensitive. So now that you know a little about his personality, here's my pregnancy story of the week. As if the five I already told you didn't count. I'm staying at my parent's house in LA this weekend, and I came alone. Jasper is always very excited to see me and is very mopey when I leave. He steals my shoes when I'm gone for long periods of time, just so he can have something of mine close to him. When I walked in the door, he jumped up to greet me, wagging the whole backside of his body, not just his tale, and then resumed his lounging position with his giant stuffed horse next to him. I walked my suitcase upstairs, and he got up and followed, then plopped down like Eeyore in the room I was in. This is how we spend our days. Getting up and plopping back down. I sat down next to him with my legs apart, and he scooted in towards my body. I patted my growing belly and talked gently to Jasper about the baby that's coming. Jasper looked at me and looked at my belly, and then layed his head on my thigh, closed his eyes, and put his paw on my belly. I tried as carefully as I could to take a picture, but didn't want to move or Jasper would move, which is why the picture is blurry. I know what you're thinking. He did that because I patted my belly. He's not really intuitive. But here's the thing. He's been different since I got pregnant, and especially since I started showing. He's gentler when we play and he sits close to my stomach instead of just my legs. Maybe it's true, maybe it's not, but I like to think my buddy Jasper can sense the little spirit I'm housing. - still craving meat, but less. Maybe my iron levels are regulating. - my ability to eat is getting smaller. I still have the appetite but I don't have the space! - leg cramps are mild. I get them and I get them often, but they aren't excruciating. - Boybie's limbs are like little needles in there. If something is jabbing me, it is JABBING. He's over the soft flutters and moved on to the karate/triathlete/elbow-mom-in-the-intestines-and-make-her-fart-in-public phase. Oh, the joy of motherhood, and it hasn't even begun. - we're ordering our crib and baby dresser this week! I can't wait to share pictures of his little nursery corner once it's all set up. - I have officially gained 20 pounds and I don't care who knows it. Except for those times when I care, just a little. - some of my food aversions are back, only without the intense nausea. Is that normal?